Northern911 offers fire dispatching and 9-1-1 dispatching services to NFPA 1061 compliant standards for clients across North America. Our team of highly trained and certified Emergency Response Specialists currently dispatch for dozens of Fire Departments, First Response Teams and Emergency Service Groups. Whether the departments are nearby, or for those over 1,000 kilometers away Northern911 has the coverage to respond to the call. Our 365/7/24 Emergency Response Centre (ERC) is staffed with professional fully trained operators capable of handling any fire related emergency. 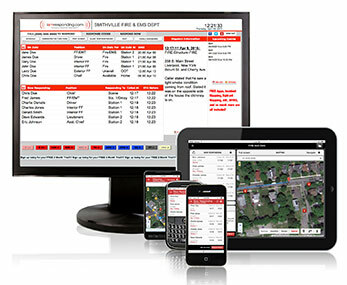 Custom FIRE dispatch procedures using intelligent scripting. Dispatching using any form of communications system requested: Mass text, direct dial and more. Full dispatching service including Hydro, Gas, Oil, etc. disconnects. Custom call configurations based on client needs. We provide a comprehensive report on each incident. Our reporting system allows for real time details of the call including access to call recordings. On demand access to call logging, call details, call recording and stats are available through Web Portal access with a secure RSA token. Please take a minute to think about how your emergency fire dispatching is handled today, and then give us a call to see how we might assist. In 2009, there was a meeting between the NFPA 1061 Technical Committee (TC) and APCO to discuss the NFPA 1061 document, the APCO P33 document, and to open the dialog between both organizations for the future of these documents. While NFPA 1061 describes individual competency/evaluation, APCO P33 compliments these requirements by defining training standards by which the Authorities Having Jurisdiction (AHJO), hiring authority, or communication center manager would use to train those that work at a specific facility. All of Northern911’s Public Safety Telecommunications Personnel are APCO certified. We are listed by Under Writer’s Laboratories of Canada (ULC) and our fully bilingual, 24/7/365 facility is inspected on an annual basis for compliance with their standards. Northern911 has a proven record for exceeding industry standards and always striving for more. This is an application that is loaded for free onto all the fire response team’s Smartphones. When an alert is activated the members of the team can press a button on their phone to show that they are Responding. That information is immediately available to the Chief and to Dispatch. When the team arrives at the Fire Hall if it is set up, a screen on the wall can show the information about the incident and the other members of the team who are responding. Record keeping, tracking, reporting and so much more! It’s wonderful technology. Find out more at https://iamresponding.com. If your department uses another application we will send an email to trigger that and still provide IamResponding should you decide to utilize it.